Grill a ham steak, baste it and serve it up with sweet-tangy sauce. 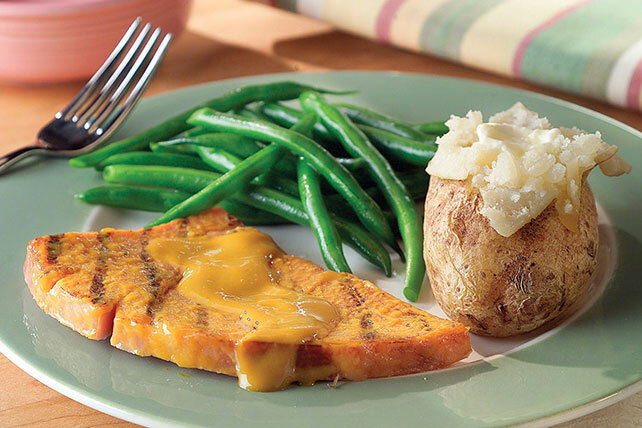 This Maple Mustard Ham Steak makes a great dinner entrée during the week. Add extra flavor by grilling over soaked hickory wood chips. Preheat broiler. Place ham on rack of broiler pan; brush with 1/4 cup of the mustard mixture. Broil, 4 to 6 inches from heat, 3 min. on each side or until heated through. Serve with the remaining mustard mixture.